Apple’s GarageBand has made child’s play out of music sequencing. But traditional composers, arrangers, and educators don’t need its recording, editing, and mixing features—what they need is notation software that allows them to quickly get the ideas in their head onto the printed page. 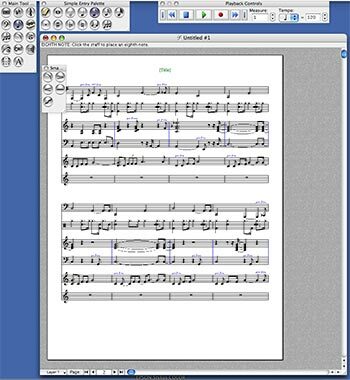 MakeMusic’s Finale Songwriter 1.0 is aimed at this kind of person, combining page-layout and music-sequencing features and emphasizing complete control over every aspect of a printed score. What separates Songwriter from traditional notation programs is the flexibility with which you can enter notes and the ability to hear the score performed as you are composing it. You can start with a blank sheet or use the Setup Wizard to guide you through the process of naming your score, choosing instruments, and selecting tempo and time signatures. Then, you can enter notes via MIDI keyboard, mouse, or computer keyboard on up to eight staves. You can perform most data entry with tool palettes. 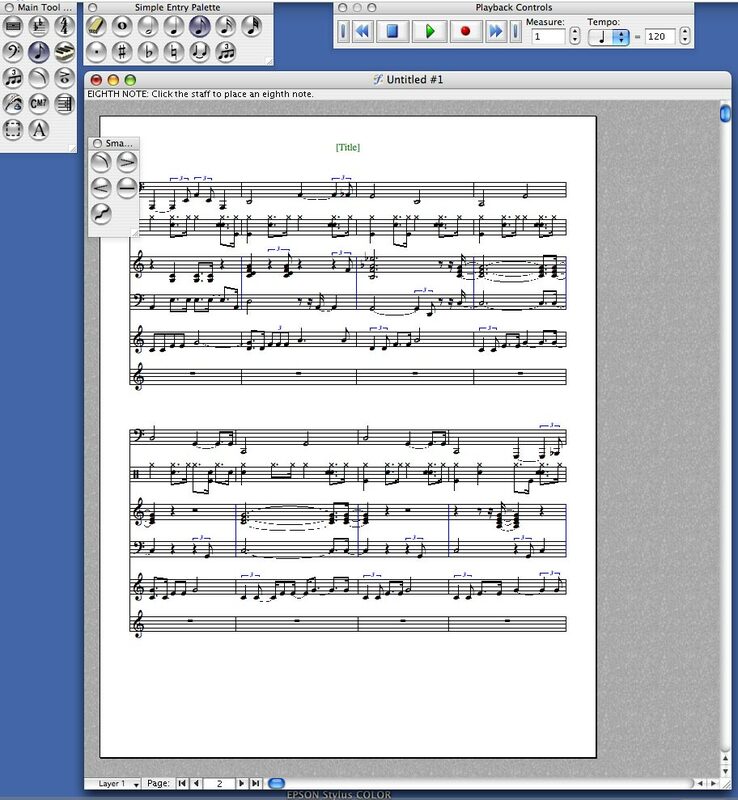 The Simple Entry palette makes entering notes as fast as entering words in a word processor, with keyboard shortcuts for choosing notes and note values, rests, accidentals, ties, and so on. You can easily enter lyrics, guitar tabs, expressions, and articulations. Of course, you can do almost everything I’ve described so far with pen and paper. But Finale Songwriter’s real-time transcription capability (a feature once found only in top-of-the-line notation packages) really sets Songwriter apart. This feature—called HyperScribe—managed to keep up with my playing, entering notes, and chord progressions nearly as fast as I could perform them. I tried to stump the software, throwing up seventh chords, ninths, augmented, and diminished chords, but it did not balk. Finale Songwriter provides a number of palettes for entering notes and note values, rests, articulations, and dynamics into your score. You can try out your song in any tempo and transpose it to any key. Auto-harmonize, a feature adopted from PG Music’s Band-In-A-Box, can enrich your melodies with harmonies based on the chord symbols in your score. Finale Songwriter also includes a SoundFont, a sample-based software instrument that can play back your score with any of 128 instruments. The instruments sound OK—but they are General MIDI instruments, which are relatively low-fidelity sound samples that don’t come close to the kind of realism available with more professional notation programs. Finale Songwriter’s Human Playback function interprets articulations, dynamics, hairpins, and other markings in order to play back the music in a particular style such as classical, baroque, or jazz. The software includes drum grooves in various styles for you to add to your score. While the PDF manual is handy, I found the QuickHelp and QuickStart videos confusing. The videos are recorded in Finale, not Finale Songwriter, and they show screenshots from the Windows version. When running the software in OS X 10.4 (Tiger), a bug prevented the music fonts from appearing correctly. (The fix was to delete a cache file in /Library/Caches called com.apple.ATS.) MakeMusic has also posted an updated font installer on its Web site, which corrects the problem. Finale Songwriter provides most of the basic tools you need to compose and publish music, at a price that is hundreds of dollars less than the top-of-the-line Finale ( , July 2004 ). So what’s the difference? Finale provides higher-quality instruments, including the ability to use third-party instruments and to scan printed sheet music. It also facilitates plug-in support and more advanced notation features, including the use of unlimited staves and non-standard key signatures. Just as GarageBand provides a stepping stone to the pro functionality in Apple’s Logic Pro, time spent learning Finale Songwriter won’t be wasted as you move up the scale to other products in the Finale family. Finale Songwriter 1.0 succeeds in providing traditional entry-level composers with the tools they need to realize a final printed score. The flexibility with which you can enter notes and the quality of the final output makes it a clear choice over pen and paper.